You’re running Britain’s most prolific automaker, and some guy knocks on your door asking you to build a two-wheeled car stabilized by a gyroscope. Of course, you say “yes.” And then you bury it. And then you dig it up. And then you decide to scrap it anyway. Or, at least, that’s the nutshell story of the Wolseley-Schilovsky gyrocar, possibly the first of its kind and possibly the shortest-lived post-disinterment vehicle in history. Rarely in history does any inventor just casually design a gyrocar, and the Wolesley-Schilovsky is no exception to the rule. Russian count Pyotr Petrovich Schilovsky might have been a lawyer and governor by trade (and reportedly a member of the Russian royal family), but — like Louis Brennan, the Swinney brothers, and Alex Tremulis after him — he was an inveterate gyroscope enthusiast who at one point served as the president of the Gyroscopic Society of Petrograd. Imagine what fun those meetings would have been. According to Douglas Self, Schilovsky got it into his head that a two-wheeled car stabilized by a gyroscope would make an excellent all-terrain vehicle for military purposes. “At this time motor vehicles were still in their infancy, and the application of the internal combustion engine to military transport had barely begun,” Self wrote. “The Russian Army was the least technically advanced in Europe, and starting its mechanisation with such an unusual and probably delicate vehicle does not sound like a very good idea.” Read between the lines and you’ll see that the concept of a military scout car was more a rationalization than a rationale for the gyrocar. Still, one does not exactly tell a Russian count obsessed with gyroscopes that he’s the one who’s off-kilter, which is how he ended up in Birmingham’s Adderley Park in 1912 laying out his plans for the Wolseley brass. To A.W. Dring, Wolseley’s chief experimental engineer, fell the task of seeing Schilovsky’s concepts to fruition. In certain respects, the gyrocar was built much like a regular four-wheeled automobile with a perimeter frame, a front-mounted longitudinal engine driving the rear wheel, and an upright-seated driver at a steering wheel. However, much like contemporary Renaults and later Mack trucks, the radiator was mounted aft of the engine, in this case a 16-to 20-hp Wolseley C5 four-cylinder. Its wheelbase stretched a mammoth 158.75 inches. Ahead of the engine was the single front wheel, mounted to a fork and girder suspended from the frame by quarter-elliptic leaf springs. And behind the driver was the gyroscope, which included a massive 1,344-pound 40-inch flywheel spun up to 3,000 rpm by a 1.25-hp electric motor. A pair of sprag wheels to either side of the chassis deployed automatically if the gyroscope stopped spinning. The car depended on a complicated series of counterweights, bellcranks, and toothed quadrants to convert the gyroscope’s motion into upright stability, especially while in motion, and it actually worked, though to a limited extent. We drove the car backwards and forwards for a distance of about six feet many times. During these tests it was noticeable that one could stand on the side of the car and step into the body without any disturbance of balance. We then moved the car partially round a radius to the left, backwards and forwards. Eventually we drove the car the whole length of the works, backwards and forwards, with four passengers. Then His Excellency decided to take the machine over on to the track, impressing me that we must go very gently. We drove onto the Arden Road, making two stops on the curve, and we had to reverse so that we should not use full lock. I then drove the car steadily up the Arden Road, going as slowly as possible and slipping the clutch in first gear all the time. 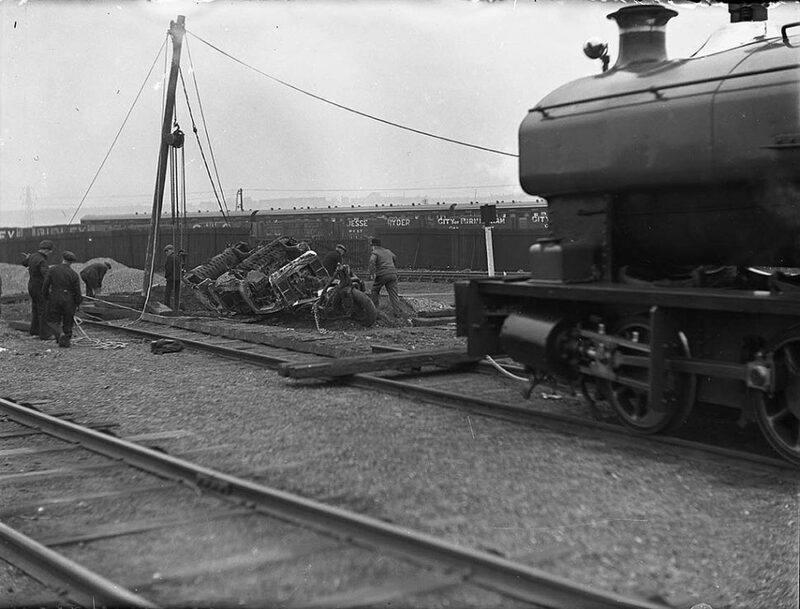 We took a wide sweep into the Bordesley Green Road, and suddenly, when opposite the Directors’ mess room, the vehicle heeled to the near side and dropped on its sprag. 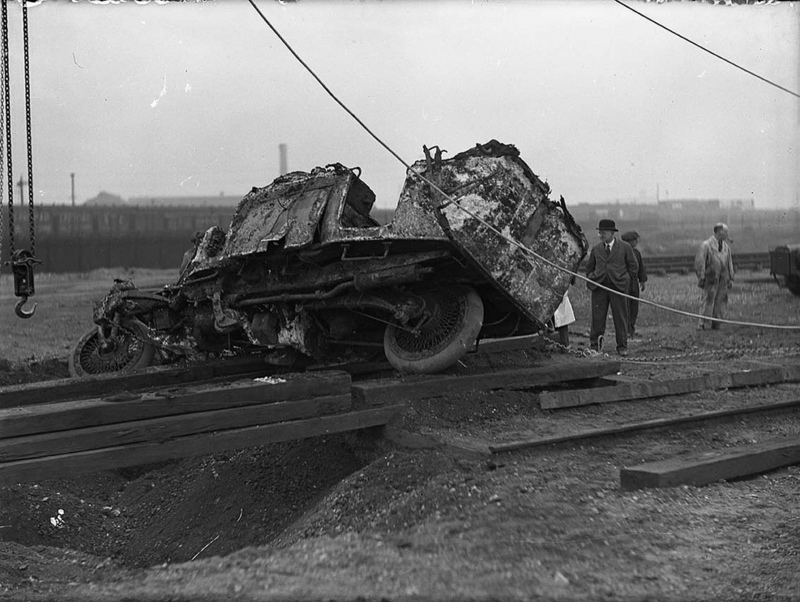 It was lifted by eight men, the engine restarted, and the car driven back to the experimental department, but it was supported by outside assistance as His Excellency did not attempt to balance the car in the street. By the spring of 1914, Dring and the count were ready to publicly demonstrate the car in London’s Portman Square. According to a New York Times account of the demonstration, the car performed adequately, if no less hesitant than that earlier test drive. The inventor sat beside the driver while the car made several circuits of the square, sometimes at slower than walking pace, the curves being negotiated without difficulty at that rate, and, of course, always with the vehicle on an even keel, as distinct from inclining it in the manner in which a cyclist rides around a curve. Then the car was brought to a stand, but as the gyroscope was kept in action it stood upright, and was unaffected by men stepping on to or off it or leaning against it. However, with the assassination of Archduke Franz Ferdinand that June and the mobilization of the Russian army in late July, whatever plans Schilovsky had for the gyrocar’s refinement got shelved. Wolseley converted to the wartime production of aero engines and other war materiel, and the gyrocar, all 2.75 tons of it, became a nuisance, especially without any way to contact Schilovsky to ask him about his plans for the car. Likely figuring they’d get hell to pay if Schilovsky returned after the war to discover his gyrocar had been melted down for the war effort, Wolseley executives decided instead to dig a big hole out by the railroad tracks and tip the gyrocar in. “This is not normally considered an appropriate method for the long-term storage of motor vehicles,” Self wrote. While Schilovsky survived the war and the Russian Revolution, and in 1922 made his way back to England, curiously he seemed to have had nothing to do with the gyrocar afterward, aside from writing about it in his book on gyroscopes and their applications in 1924. His disinterest may have had something to do with the railroad tracks laid atop the gyrocar’s burial site that seemingly made it impossible to exhume the car. Seemingly but not actually. 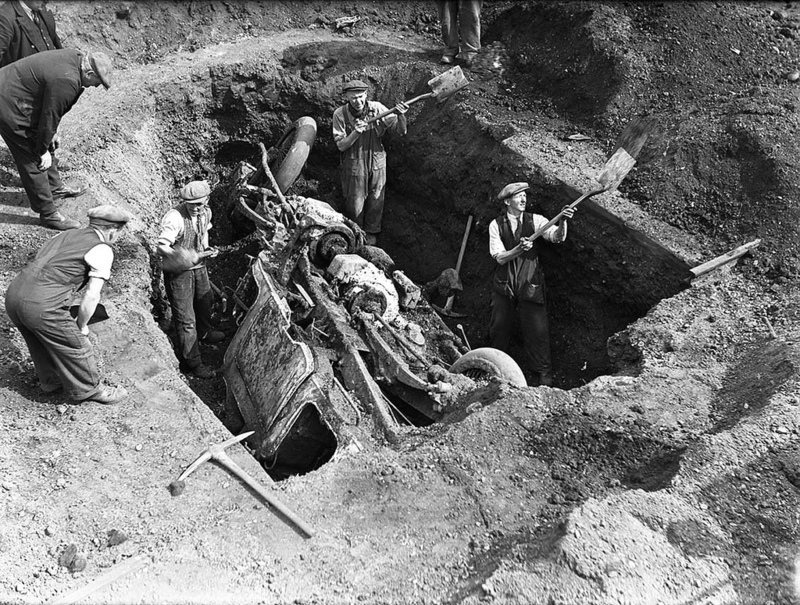 In 1938, Morris Motors — which had by then bought Wolseley — got permission to tear up the track above the gyrocar and send a few men out with pickaxes and shovels to dig the car up. As we can see from a series of photos uploaded to the British Motor Industry Heritage Trust’s Flickrstream, the gyrocar remained in decent shape after nearly a quarter century underground. Some of the upholstery survived intact and the tires even apparently held air. 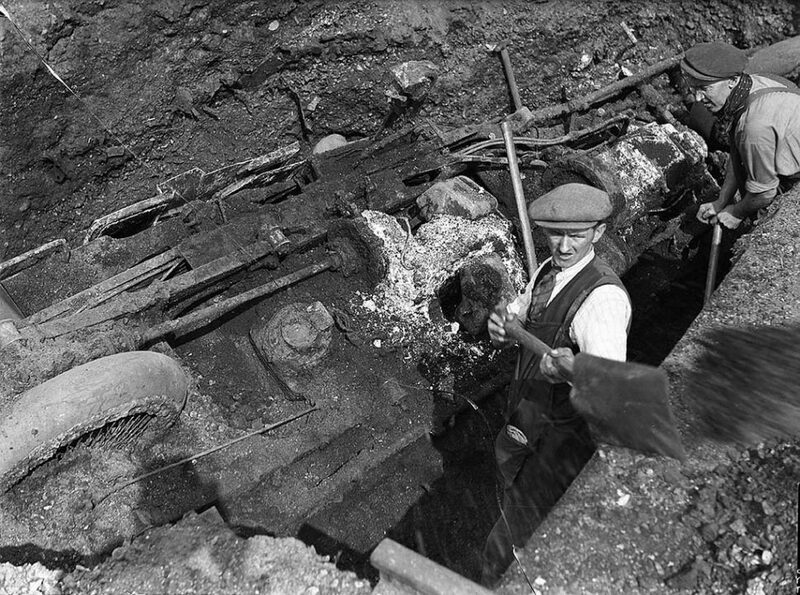 The Wolseley men then removed the body and restored the chassis for the Wolseley museum. They even replicated the gyrocar’s original OA 1941 license plate for display. No word whether they got it into working condition or whether Schilovsky — who lived until 1957 and continued to invent gyroscopically stabilized things throughout his life — had a hand in its resurrection. Though Wolseley geared up for war again not long after, the gyrocar remained aboveground through World War II. It even survived the Birmingham Blitz that destroyed parts of the Wolseley factories. Then, just a decade after Wolseley men unearthed the gyrocar (“In what can only be described as a act of bestial philistinism,” Self wrote), they scrapped it. Nothing apparently remains of the world’s earliest known gyrocar today.